This double chocolate mousse entremets recipe is Mary's interpretation of the showstopper challenge in the Patisserie episode of Season 1 of The Great British Baking Show. It is explained in further detail by Mary in Season 1 Masterclass: Part 4. Grease and line a 13in x 9in swiss roll tin with baking parchment. Cut a sheet of silicon to fit the base of the Swiss roll tin. Line a baking sheet with baking parchment and lay the silicon sheet on top. For the decorative paste, cream the butter and icing sugar together until light and fluffy and then gradually add the egg white, beating continuously. Fold in the flour and cocoa powder. Spread the paste thinly and evenly over the silicon mat with a palette knife. Drag a pastry comb or a fork diagonally through the paste to form a pinstripe pattern, scraping off the excess mixture after each drag. Place the baking sheet in the freezer for 15 mins. For the joconde sponge, heat the oven to 400F. Whisk the egg whites in a bowl until stiff peaks form when the whisk is removed from the bowl. Add the caster sugar, one teaspoon at a time, whisking between each addition to make a glossy meringue. Cover with cling film and set aside. Tip the ground almonds and icing sugar into the bowl of a free-standing food mixer and add the whole eggs. Whisk together for 3-5 minutes, or until doubled in volume. Fold in the flour, and then gently fold in the meringue in three separate batches. Pour the melted butter down the side of the bowl and fold in, until incorporated. Remove the silicon sheet from the freezer and place into the base of the lined swiss roll tin. Tip the joconde sponge mixture over the pinstripe paste and level the surface with a palette knife. Bake for 5-7 minutes until pale, golden-brown and springy to touch. Place a sheet of baking parchment over a cooling rack and turn the cake out onto it. Peel off the baking parchment and silicon sheet from the base of the cake and leave to cool completely. 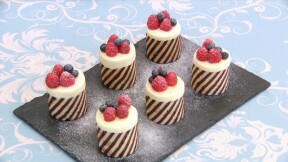 Line 2½in chefs rings or mini cake rings with baking parchment. Cut a rectangular template measuring 7in x 2in, from a piece of parchment paper. When the sponge is cooled, trim the edges and cut out 6 rectangles of sponge using the template. Wrap the cake strips inside the cake rings, stripey side facing out. Once wrapped inside the rings, gently push and press the ends to meet together to make a seamless cake. You want the joconde to fit very tightly pressed up to the sides of the cake rings. Using a small 1½in round cutter, cut out small circles from the cake trimmings and push them into the base of the cake rings. For the dark chocolate mousse, place the chocolate in a bowl set over a pan of simmering water. Melt slowly and do not allow the chocolate become too hot. Stir in the butter and mix until combined. Add the egg yolks and brandy and set aside to cool a little. Whisk the egg whites to stiff peaks and fold in. Whip the cream to soft peaks and fold into the chocolate mixture. Spoon into a disposable piping bag and pipe into the cake lined rings, until the mousse comes three quarter of the way up the sponge. Chill in the freezer while you make the white chocolate mousse. For the white chocolate mousse, place the chocolate in a bowl set over a pan of simmering water. Melt slowly until warm - DO NOT allow the chocolate to become too hot. White chocolate can be tricky, so watch it like a hawk and as soon as it has melted, remove the bowl from the pan and set aside to cool a little. Whisk the egg whites to a stiff peak and fold in. Whip the cream to soft peaks and fold into the chocolate mixture. Spoon into a disposable piping bag and pipe on top of the chocolate mousse until it reaches the top of the cake rings. Chill in the fridge until set. Once set, turn out of the cake rings and place on serving plates. Top with the raspberries and blueberries and dust with icing sugar.